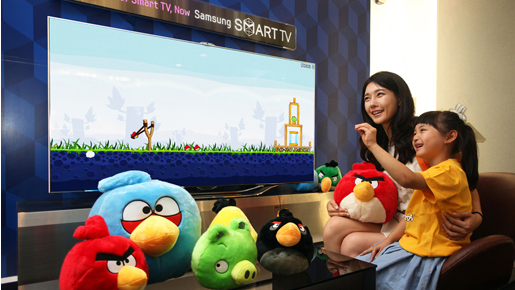 Announced at this year’s CES 2012, Samsung has revealed that it will be bringing Rovio’s Angry Birds to its Smart TVs this month, allowing owners to smash pigs from the comfort of their sofa with new gesture-based controls. The Smart TV app will be the first Angry Birds title to operate on a TV without the need for a set-top box, utilising the recently updated Smart TV SDK, which now supports gesture controls and voice interaction. The partnership also extends to content, meaning that Angry Birds animated shorts will also come to Samsung’s range of connected TVs. The app will be available for Samsung’s 000/8000/9000 Smart TV models via the Samsung TV Apps portal. It will be released simultaneously around the world, ensuring that nobody is left waiting for the game to launch. Rovio has plans to launch its games on consoles in the coming months too, showing there is still quite a bit of life in the Angry Birds franchise, especially now it’s broken its mobile shackles and heads to new devices.